This classic Italian dish is perfect for special occasions. Sweat onion and garlic before combining with shitake mushrooms. Add rice and cook until grains turn translucent. Pour in the wine and slowly add stock, stirring continuously. Fry Isle of Man Queen Scallops in a separate pan for 1-2 minutes a side then add wild mushrooms and courgette until crispy. 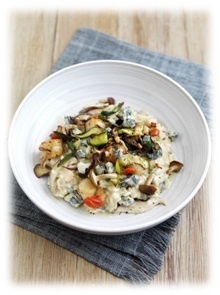 Stir Gorgonzola piccante and lemon zest through the risotto before topping with scallops, courgettes, wild mushrooms and crumbled Gorgonzola. A simple but spectacular dish!